Eyþór Ingi Gunnlaugsson was born on May 29th 1989 in Dalvík, a small fishing town of approximately 1,400 inhabitants in northern Iceland. Dalvík has nurtured some of Iceland’s greatest singers as it’s also the birthplace of Friðrik Ómar of Euroband (Icelandic Eurovision 2008), and Matthías Matthíasson of Sjonni‘s Friends (Eurovision 2012). Erna Hrönn Ólafsdóttir and Hera Björk (both Eurovision 2010) also lived there for a time. Music was clearly a major part of Eyþór Ingi’s childhood; he used to sing Elvis Presley songs while still in kindergarten and he also loved acting. In 2004, at the age of fifteen, he won a part in the Icelandic version of the musical Oliver!, which turned out to be one of the most successful theatrical works ever staged in Akureyri, the capital of northern Iceland. This was only the beginning of his theatrical career as he was offered a part in Óvitar in 2007 as well as taking the leading role in a college staging of the musical Jesus Christ Superstar. 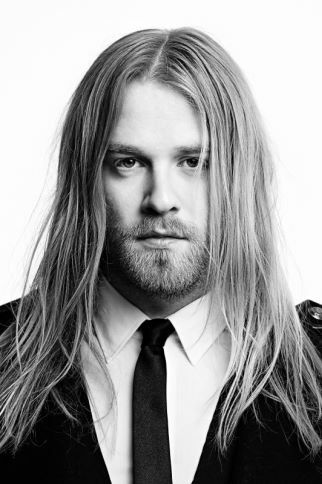 Eyþór Ingi won the College Song Contest in the spring of 2007 and was selected to compete as a contestant in TV talent show ‘Bandið hans Bubba‘. After winning the show in early 2008 he soon began working as a professional singer, musician and sound technician. Eyþór Ingi founded the progressive rock group Eldberg and in 2010 joined the renowned Icelandic band Todmobile, contributing to their seventh album, which was also entitled ‘7’. In 2011 Eyþór Ingi was nominated as best singer in the Gríman Theatrical Awards for his role as Riff Raff in The Rocky Horror Picture Show. The following year he played hippie leader Berger in the musical Hair, He also featured in the cast of Les Misérables as law student Marius Pontmercy, when the musical was staged in Þjóðleikhúsið, the National Theatre of Iceland, in 2011-2012. Eyþór Ingi was inspired to start singing by the music of Jeff Buckley and is also a big fan of David Bowie, Thom Yorke, Ian Gillan and Freddie Mercury. He has been a member of a Deep Purple tribute band and performed in the Freddie Mercury Tribute Show in Harpa Concert Hall in 2011-2012. This was Eyþór Ingi’s first time in Söngvakeppnin and he’s very much looking forward to participating as Iceland’s 26th entrant in the 58th Eurovision Song Contest in Malmö.